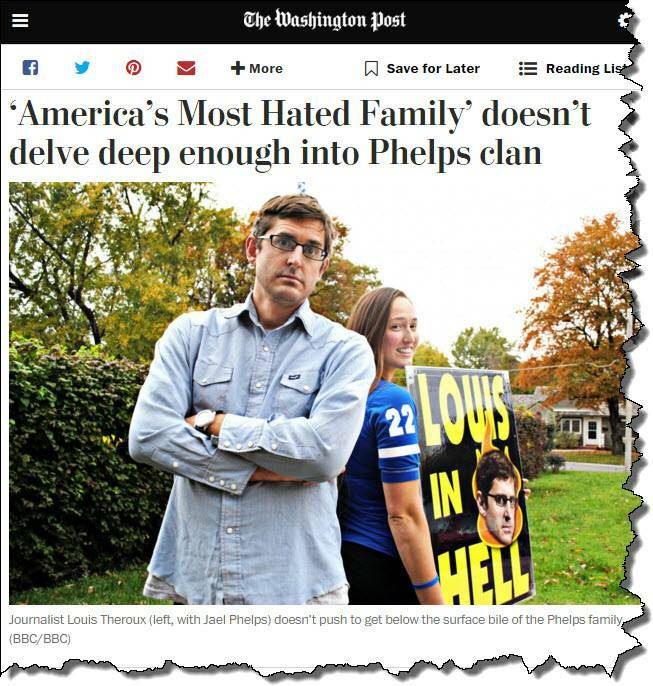 The Washington Post said the film “doesn’t dive deep enough” into the Westboro Baptist Church family. The Westboro Baptist Church, a hate group masquerading as a Christian church, was the subject of a documentary by Louis Theroux. They call themselves the most hated family in the US and they picket funerals of soldiers killed in Iraq. So what did Louis Theroux make of the Phelpses after three weeks? In any country, let alone one as patriotic as the US, few actions are as provocative as protesting at a soldier’s funeral. The Phelps family pickets mourners across the country, to mark what it describes as God’s revenge on the US for tolerating homosexuality. Their actions are in the name of the Westboro Baptist Church, which numbers 71 and is headed by “Gramps”, preacher Fred Phelps. The church, which is based in Topeka, Kansas, mostly comprises his extended family. Louis Theroux, himself no stranger to people with unconventional views, says the Phelpses are the most extreme people he has ever met. But in the following interview, he reveals how three weeks with them left him perplexed by their motivation. What we’re trying to do in the documentary is look at an activity that is so antisocial, so strange, so futile and at its worst, so cruel, and we’re saying “Why? Why do that?”, especially when you seem to be, for the most part, kind and sensitive people. We’re exploring what is cruelty, trying to explain how something that really does very often just amount to cruelty could be perpetuated and passed down in a family. Why would nice people do such horrible things? I think that the pastor is not a very nice person. I think he’s an angry person who’s twisted the Bible and picked and chosen verses that support his anger, that sort of justify his anger, and he’s instilled that in his children and they’ve passed it on to their children. Although the second and third generation are by and large quite nice people from what I saw, they still live under the influence of their Gramps.